First up on the list of Christmas inspiration this week is Merry Mantels! I love decorating my mantel for Christmas and strive to mix it up a little each year. Of course some sort of greenery or garland usually finds it way on to most Christmas mantels. Love the red, glittery saying added to this mantel – it makes this mantel! The grapevine garland on this mantel is gorgeous too and I also love the hanging ornaments and the simple “Christmas” sign. 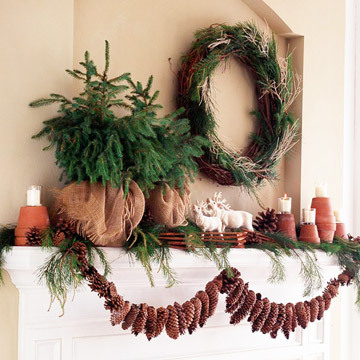 This pinecone garland is pretty as well – perfect for a natural, rustic looking mantel. Here is Kevin and Layla’s mantel from last year – aren’t the striped stockings and the presents stacked up in the fireplace adorable? 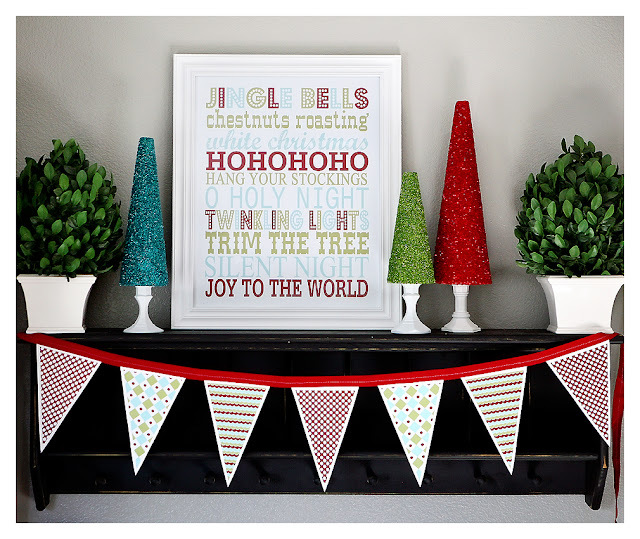 Love the ledges over this mantel with the Christmas prints on them – so pretty! Christmas mantels don’t have to be all red and green either. This all-white Christmas mantel is gorgeous! Just remove the “Christmas” letters and it could easily transition into winter too! Here is another no-red mantel by Kate at Centsational Girl. The silver, white, and green is pretty too! Love the simple garland and candles on this mantel and the tree reflecting in the mirror! More hanging ornaments and cranberry filled candle holders on this mantel. So whether your mantel is adorned in red and green and lots of greenery, or simple and rustic with pinecones and burlap, or just simple candles (even battery operated ones!) with some light greenery, it is all pretty! 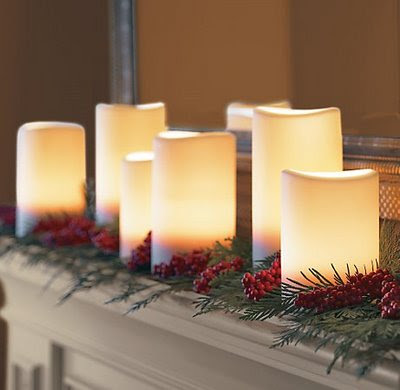 What is your favorite way to decorate your mantel? Do you use greenery and the classic Christmas colors, go with the natural look, lots of candles or something else? Working on finishing mine up tonight! Lots of pretty mantels… Can’t wait to see yours! I don’t have a mantel, but I decorate my ledge between the living room and kitchen and the top of a narrow bookshelf. It’s one of two few places out of the Davis Man’s reach. I couldn’t help but think of how QUICKLY he would destroy most of those decked out displays!! Super cute stuff just laying out???? Forget it!!! 🙂 Though I did just put some greenery and lights in a iron basket on the floor tonight. I’m hoping for a miracle. 🙂 We even went with a table top tree this year to hopefully keep him from tearing it down, ha ha! I’ve never done much more than put up the Christmas cards we receive, but I would like to do something prettier this year. Love the candles in the last picture you’ve got! the candles are very pretty! Very pretty ideas! We just set up our tree last night so maybe today I’ll work on my mantel a little. Not sure yet what I’m going to do this year though…guess we’ll see!